If you activate a Trap Card (except during the Damage Step): You can Special Summon this card from your hand. 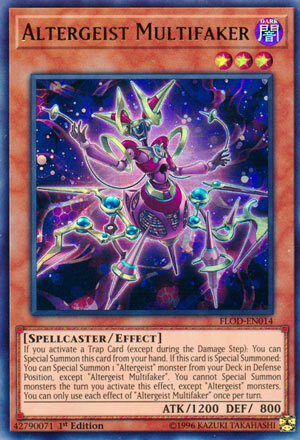 If this card is Special Summoned: You can Special Summon 1 “Altergeist” monster from your Deck in Defense Position, except “Altergeist Multifaker”. You cannot Special Summon monsters the turn you activate this effect, except “Altergeist” monsters. You can only use each effect of “Altergeist Multifaker” once per turn. Altergeist Multifaker finishes the week and, as previously stated in the week, is a key card to helping out the archetype. Special Summon ability off a trap activation (which the deck does A LOT), during either turn, another positive. Whenever Special Summoned Multifaker thins the deck and Special Summons another Altergeist, setting up a Link, Synchro, or Xyz Summon. You are locked out of anything but Altergeist monsters this turn, but if it’s during your opponent’s turn that doesn’t matter. End Phase trap activation, set up your play for next turn, simple and effective. Multifaker replenishes Hexstia’s ATK boost and negation ability, sets up your summon plays, replenishes your board, thins the deck to better your chance at getting to other cards you may need, it’s crucial to the playstyle. If a trap gets played, Multifaker may make an appearance. Alright, you probably knew we had to get Altergeist Multifaker in here, so the end of the week was the best spot I felt. Multifaker is a Level 3 DARK Spellcaster with 1200 ATK and 800 DEF. Stats are fine on a Level 3, they are rarely very strong, DARK and Spellcaster also makes for a nice combination (though I should mention all these varying attributes can hurt Altergeist against Gozen Match). If you activate a Trap Card (except during the Damage Step as most cards are like) you can Special Summon this card from your hand. A quick Special Summon is nice and on turn 1 it can combo well with Infinite Impermanence to summon this and use the other effect to get to Silquotous so the latter can bounce the Multifaker back for reuse while also disrupting the opponent with the Impermanence and the Silquotous. If Multifaker is Special Summoned, you can Special Summon any Altergeist monster from your deck in Defense Position but you cannot Special Summon the turn you activate that effect except for Altergeist monsters. If you already got the Silquotous, likely off the first activation of Multifaker, you can get Meluseek to send off Protocol if need be or use Multifaker and the Meluseek if you got another Multifaker in your hand for a Hexstia or use the Meluseek later on for a Linkuriboh for Meluseek’s search. You can also get Kunquery out of your deck to bounce with the Silquotous to have some battle protection waiting in your hand. You might not want to get Marionetter unless you really want to bounce it with Silquotous since Marionetter only sets a Trap from the deck upon Normal Summon. Multifaker is the heart and soul of the Altergeist deck, hence why it is at one in the OCG while they also have Personal Spoofing at two to make this harder to get to, but the TCG still has three of this and Spoofing since they are starting to favor Guru Control more as a control deck, but Altergeist can still compete at least and you still play three Multifaker in the TCG unless they decide to limit it as well, it’ll likely always be the best Altergeist monster. Art: 4.5/5 Copy and paste with all the Altergeist cards this week with the art, lol. Altergeist Multifaker…I think about this and wonder why/how you’d be a faker in multiple things. Isn’t it common to do multi fakes, so to speak, as opposed to one? Or if you’re a faker, does it need to be specified you’re a Multi-faker? Anyway, Dark, Spellcaster, Level 3, 1200 attack and 800 defense. Dark is good, Spellcaster is still good too. So first off, Multifaker can Special Summon itself from your Hand when you activate a Trap card (save the Damage Step). Any Trap, on the turn of any player, just spring a Trap. This leads to a fun and useful effect you can use offensively or defensively as a part of various combos (likely for a Link Summon) to Special Summon another theme Monster from your Deck in (face-up) Defense position. Naturally, there’s the token clause you can’t bring out another Multifaker. You’re also prevented from Special Summons outside of the theme, but that’s hardly an issue (and more reason you’d use that effect on your own turn). Naturally, (again), these effects are once per turn. This is probably the most important piece we look at this week, because it’s the setup one. Art: 3/5 Meh. The Light and darkness is still in play here, though I think this is my least favorite of the ones we looked at this week. Happy Friday! I am here for the best of the best, Altergeist Multifaker. This is a Level 3 Dark Spellcaster-type monster with 1200 Atk and 800 Def. The stats aren’t bad for a Level 3, and the type and attribute are perfect for each other. Even without all the theme support, Altergeist Multifaker Special Summons itself from your hand during either players’ turn if you activate a Trap Card. This first effect is really good and lets you instantly replace your field pressure and set up plays. Speaking of setting up plays, upon Special Summon Altergeist Multifaker Special Summons any different Altergeist monster in Def mode. This particular effect locks you into only Special Summoning Altergeist monsters for the entirety of the turn. However, having the ability to do this during your opponent’s turn should make for easy Extra Deck plays the turn after. Each effect is only once per turn, but that is to be expected with effects like these. I like the versatility that Multifaker provides since traps will always be a thing and any new Altergeist monster can be Special Summoned. The only real downside is the once per turn aspect. It also looks very insect-y, so eh. Enjoy the weekend!